Encouraging wildlife into your garden not only helps with pest control, but also ensures you learn more about your native fauna. 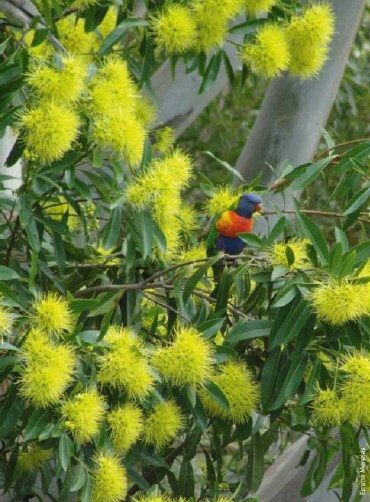 As Australian cities expand and more land is cleared, fewer areas of habitat remain for native wildlife. This, coupled with the likely future impacts of climate change, make it imperative that we all do our bit to help native animals survive. Horticulturist and environmentalist, Joan Dillon, has spent the past 15 years encouraging a range of native animals into the garden. The methods are working. There are at least I0O bird species—as well as lizards. bandicoots, wallabies and spectacular Richmond bird wing butterflies— all cohabitating on her four- hectare Land for Wildlife property situated at Hunchy, on Queensland's beautiful Sunshine Coast hinterland. Much of the Dillon property is regenerated and replanted bushland on a former dairy and grazing property, bat loans 2000 square-met-e garden contains an eclectic mix ornamentals, native plants, an extensive orchard and productive vegetable garden Wrens and other birds regularly visit the patch to eat grubs and keep insects at bay and don’t spray with chemicals. The birds do some of the work, but she also plants according to the climate. For example, in humid weather, Joan avoids zucchini because they got powdery mildew. Joan is conscious that, as our climate changes, Animals will not only need to move through the urban environment, but will require places in backyards to live. She encourages neighbours to work together to create corridors for wildlife movement but also celebrates planting attractive habitat enclaves in her own backyard. A Favorite spot in the garden encapsulates the message perfectly. Joan has a cool haven that features a remnant sandpaper Fig. Ficus fraseri, Is fruit attracts masses of insects, which are food for the resident honey eaters. Birds splash in a water dish, hanging in the tree. Small honeyeaters swing on a draping hoya vine and sip nectar From the splendid waxy flowers. A selection of shrubs beneath the tree's canopy produce fruit For the birds and lush green ferns provide the perfect ground cover. "it's not a large area of the garden, but there's food. water and shelter for birds and other animals that regularly visit. Providing some habitat lice this is easy For all of us to do.” Expert says. whose passion for plants and wildlife started in childhood. She loves nothing more than to spread the word about ways to attract Fauna into the garden. The first step, says Joan. is to start by planting species that are suited to your local area. As well as rood these plants will provide homes for local birds and insects. Understand your soil. Some species, such as grevilleas, ere sensitive to water logging. And so they need a spot with good drainage. Another of Joan’s practices is to plant in layers. Select a diverse range of species that grow to different heights. Ground covers provide shelter for insects and lizards low- and medium –growing shrubs are a haven for birds. and an upper storey provides shade protect on and habitat for larger birds. Small birds Ike to nest in prickly, native shrubs. 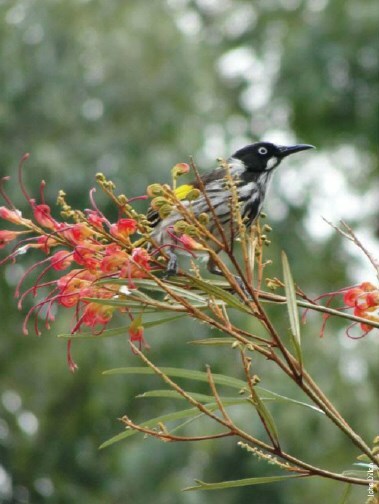 Be aware that larger flowering grevilleas are likely to attract more dominant honeyeaters. Which often chase away the smaller birds. Planting some exotic favourites is fine, but Joan warns that it is very important to manage these carefully. Any seed or propagate easily might escape to invade bushland or local wale ways. It's also important to supply water for the birds to drink and bathe in. Joan suggests terracotta pot saucers, because they rarely bp over. Be sure to place the water near the habitat so that, when the birds or lizards are drinking they are well hidden and protected. While most of us are hardwired to create neat gardens, Joan recommends deliberately leaving an untidy spot where lizards and other small animals can hide. "They love a pile of rocks, rotting logs and mulch litter. As the mulch breaks down, t creates Food For the insects and fungi in the soil Mulching with straw, hay and even pine bars also keeps the soil cool. Joan believes one of the keys to creating an effective wildlife- friendly garden is to select a range of plant species so that your yard has something in flower and fruit all year. "Birds such as honeyeaters are essentially omnivores. They eat fruit, nectar and insects, and need that diversity of food all year. Banksias are a great winter food source in south-east Queensland, check what s available near you. Know your region and its soils. Work with the landscape and its plant species to help create biodiversity, sustainability and lots more native wildlife to your garden. Most people visit a zoo to see a koala, but Emma Menzies is lucky enough to have them regularly visit her backyard. She lives at Marcus Beach on Queensland’s Sunshine Coast, and lists birds, fruit bats, frogs, lizards and snakes as inhabitants of her wildlife- friendly garden. Menzies' 870-square-mctrc patch includes fruit trees, vegetable garden and many native plants that attract the welcome menagerie. She started with a wish list of all the wildlife that she wanted to visit, and then did some research to plan the approach. Birds were top of the list so, as well as native trees, she added a birdbath to the garden. “I filled it with water and it’s amazing how many birds come to bathe every morning. Attracting some birds was literally that simple. '’ she says. She also has nest boxes in the trees designed to attract bats, possums and the birds. The Frog pond came next. Native grasses planted around the perimeter create shade and Menzies also added rocks and stones for the lizards and green tree frogs to hide under or sunbathe on. She has cleverly planted fruit trees in amongst copses of native species that flower at the same time. While the birds happily rest on the Fruit trees, they prefer to feed on the natives, leaving the family’s tropical peaches alone. In the beautiful country, with so much amazing wildlife and we need to look after it. You don't need a huge garden. You can easily plant some native trees or shrubs for habitat on a balcony.